I use this problem set as a way to introduce students (mostly sophomores) to reading a technical article from the literature. The paper is Austrheim, H, 1987, Eclogitization of lower crustal granulites by fluid migration through shear zones, Earth and Planetary Science Letters 81:221-232. The paper describes Grenville-age mafic and anorthositic granulites in Norway re-metamorphosed under eclogite facies conditions during the Caledonian. The granulite-facies assemblages persist metastabiliy, and only become eclogite assemblages in or near shear zones where fluids allow the granulite->eclogite reactions to occur. I try to have this problem set serve a number of purposes. First, I ask the students to answer a number of guiding questions so that they work through the paper and look up terms as needed. Some of the questions are directly from the text, and others more are open-ended. I wrap-up the problem set with a 'virtual field trip' of the area discussed in the paper. This slide-show works out much better than similar ones I do in this class, because they have all read about the area and have tried to visualize the field relationships already. The virtual field trip typically leads into interesting discussions about tectonics and metamorphism, polymetamorphism, the meaning of facies, how petrology is done in the field, and how metastability is necessary in order to interpret metamorphic history. 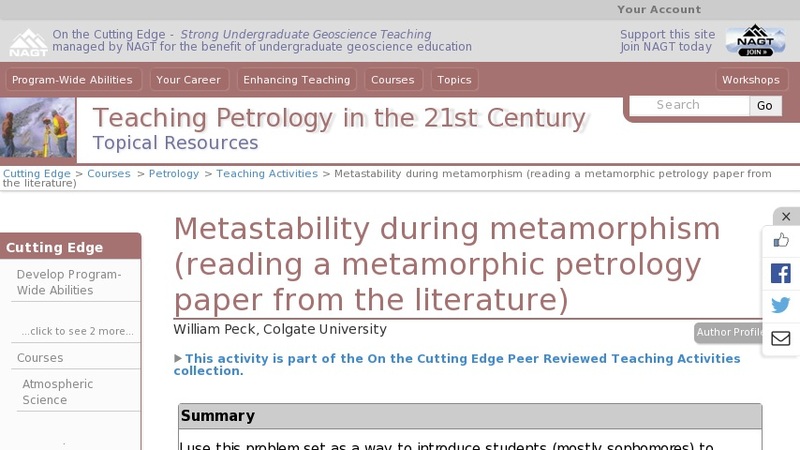 In an advanced class other papers by Austrheim and co-workers can be used to explore pseudotachylites and the interplay between metamorphism and seismicity.